The use of “meer” is quite versatile. It is used in a comparative context, and usually translates to “more”, although many other translations may apply too, see the Examples. – “Min of meer”: more or less (lit. : less or more). – “Onder meer”: among others, among other things. – “Des te meer”: all the more. – Minder: less [adverb/indefinite numeral]. – Veel: many [adverb/indefinite numeral]. – Weinig: little [adjective/adverb/indefinite cardinal]. As a noun, “meer” translates to “lake”. The Netherlands have a lot of (very) small lakes, although they are usually called “plassen” (lit. : pools/lakes). The biggest lake in the Netherlands is the IJsselmeer, which used to be a sea (the Zuiderzee), until it was closed by a 32 km dam, the Afsluitdijk, in 1932. – Oceaan: ocean [noun] [de oceaan, de oceanen]. – Strand: beach [noun] [het strand, de stranden]. – Zee: sea [noun] [de zee, de zeeën]. 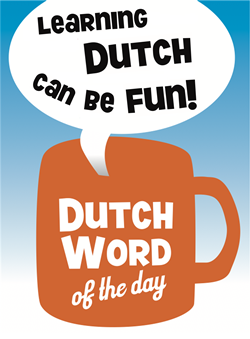 This entry was posted in Dutch word of the day, DWOTD 1.0, Vocabulary Basic and tagged meer by Marc. Bookmark the permalink. The Netherlands have a lot of (very) small lakes, although they are usually called “plassen” (lit. : pools/lakes). Or is this another of those “geslacht”-type words with dual interesting meanings? 1. “Plassen” is the plural of “plas”, which translates to “(small) pool” or “(small) lake”. 2. “Plassen” is a regular verb [plassen, plaste, h. geplast], which translates to “to pee”. BTW, “plasen” does not exist in the DUtch language. This just shows though beware of Google translate, which gives “plasen” as the Dutch translation of “lakes”.